Most of our customers purchase a home in a community association, whether it is a POA, HOA or Condo Community, because they are looking for an established quality of life. They want the houses and lawns to be properly maintained, they want the covenants enforced to help maintain their property values, and in some cases, they utilize the amenities their community has to offer to further their enjoyment in where they live. Now more than ever, community cohesion is vitally important to our quality of life. Our local communities play an increasingly important role in how our children and grandchildren view the world around them. This is why GNO Property Management, LLC. 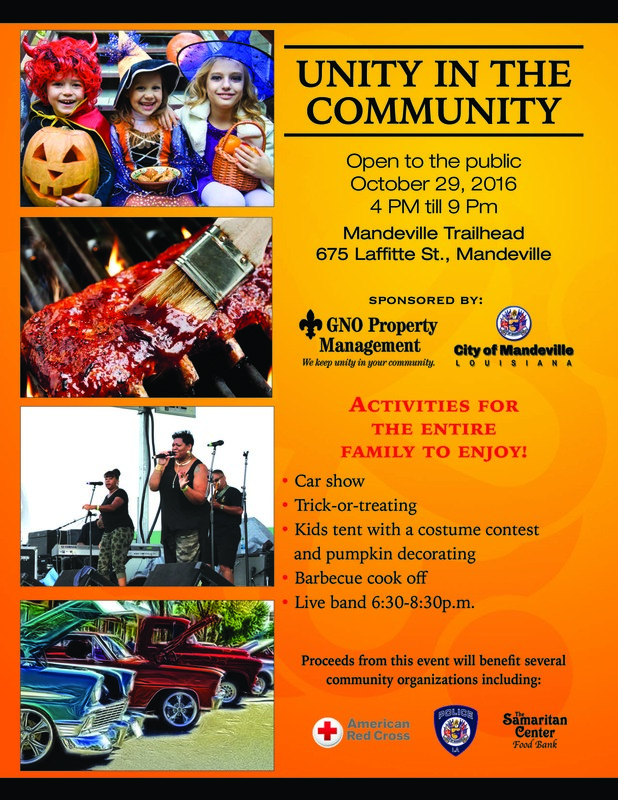 is hosting a “Unity in the Community” event on October 29, 2016, from 4:00pm until 9:00pm with the City of Mandeville. This event will be the first of its kind in South Louisiana and will include several activities for the entire family to enjoy including a Car Show, Trick or Treating, a kids tent with kids activities, a Halloween Costume Contest, a BBQ cook-off, and a Live Band. The location of the event is the Mandeville Trailhead, 675 Lafitte Street, Mandeville, LA and it will be open to the public. For the BBQ Cook-off, we are looking for 5 member teams that will represent their subdivision, one team per community. The winning team will receive a trophy, a Cook-out for their entire community at a later date, and other prizes. Some of the local leaders will be the judges of the BBQ. The meat will be provided for the competition. If you are interested in representing your community, please notify your Board of Directors and your community manager. People attending the event may purchase food tickets for $10.00. There will be a kid’s tent where a costume contest and other activities will take place. Awards will be given for the winners of the contests. Entry to the kid’s tent will be $5.00 or 5 non-perishable food items per child. GNO preferred vendors will have trick or treat booths at the event where the children can safely collect candy. The car show will be in the Trace parking lot and will be a cruise-in style event. If you have a cool modern or classic car, we encourage you to bring it over. Proceeds from the event will benefit a few community organizations including: The Samaritan Center Food Bank, The Baton Rouge Flood Victims/Red Cross, and the Mandeville Police Department. We are looking for additional business sponsors to assist with this event, to help us promote “Unity in the Community”, and to help us make a bigger impact on the abovementioned organizations. If you are interested in being a sponsor or would like to volunteer with the event, please contact Allison Hescock with GNO, (504) 528-7028. We have various sponsor packages available. We hope you will join us on October 29, 2016 for this family event.